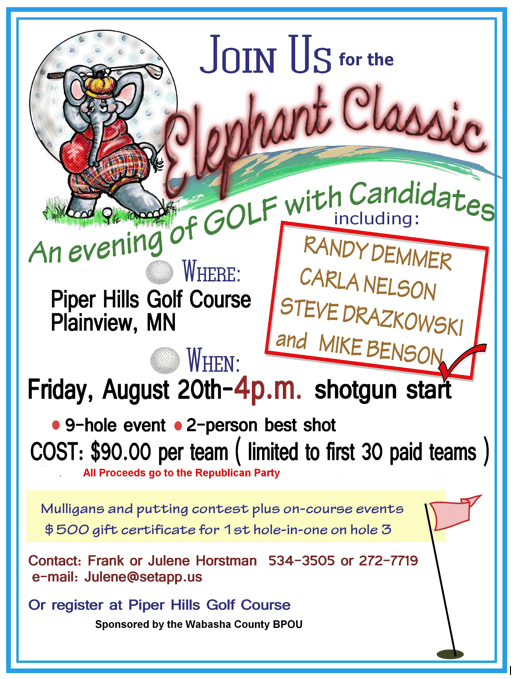 Get Your Team for the Elephant Classic! Please consider participating in this upcoming golf fundraiser on Friday, August 20th. The Elephant Classic begins at 4:00 p.m. at Piper Hills Golf Course in Plainview. We have some great conservative volunteers in Plainview doing great things to promote a change in direction at the Minnesota Legislature and in Congress! Thanks to Frank and Julene Horstman for all of their efforts in organizing this awesome event. The cost is $90 per team. Call Frank or Julene to register today: (507) 534-3505 or (507) 272-7719. Please consider putting together a team for this event and joining us!